This month, the McCarron and Co bespoke luxury kitchen designs team, along with twelve clients, had the pleasure of experiencing a ‘Chef’s Table’ dinner hosted at the stunning new Miele Gallery in Cavendish Place, London. Head Chef and Founder of Ink Restaurant Martyn Meid wowed guests with a spectacular menu of the freshest seasonal ingredients, all presented immaculately and bringing an explosion of flavour with every mouthful. 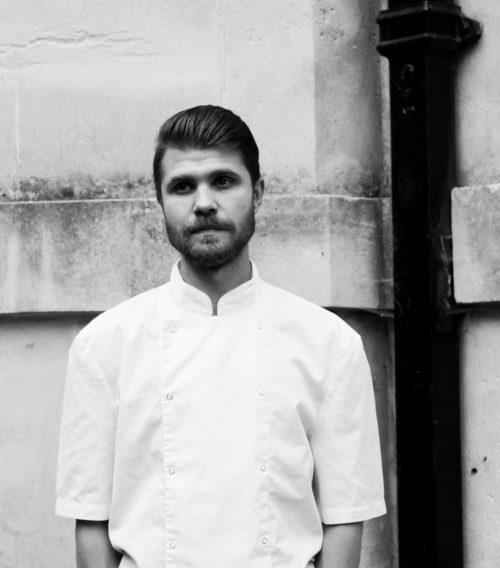 Lithuanian born Chef Martyn is passionate about using seasonal and local produce to make up his Nordic inspired menu and proudly states that all his ingredients are sourced from within the UK. Before our tasting began, we were shown around the newly refurbished Miele Experience Centre which features four beautiful kitchen displays all with the very latest appliances from Miele. We were also given a brief and insightful history of the family-run brand which spans all the way back to 1899. After taking in our impressive surroundings and relaxing with a glass of champagne, we were seated at the table and given an introduction by Head Chef Martyn into what we were about to experience. As each of the seven courses came out, we were wowed by the avant-garde presentation, intensity of colours and the unique array of flavours. With each course came an equally impressive glass of wine, each one handpicked to perfectly complement the individual dish. Martyn cooked his food using a range of top Miele appliances, mostly using food which had been pre-prepared in the new vacuum-sealer drawer by Miele, before proceeding to ‘sous-vide’ the food using the Miele M-Touch Series Steam Oven. Sous-vide cooking (previously being thought of as a domain for the professional chef only) helps preserve flavours and maintains moisture when cooking. By sealing the food in an airtight plastic bag using the vacuum sealer, food stays fresher for longer and it is a perfect way to marinade meats and fish. This optimizes food storage and extends food freshness by up to three to five times. Once having been sealed, the food can be cooked in the steam oven at a low, constant temperature (ranging between 40°C to 100°C) for an extended time period of up to 10 hours, depending on the type of food you are preparing. Vacuum-sealed food is not only good for freezing , but is also for preventing food from freezer burns. You can set the vacuum-sealing stage and duration of the drawers using high-tech controls that are revealed on opening the door. Miele Vacuum-Sealing Drawers are available in several finishes, including Obsidian black, Brilliant White, Havana Brown and Stainless Steel/Clean Steel. Visit the Miele website for further information, technical specifications and pricing here. By the end of the evening having being thoroughly ‘wowed’ by the food, everyone was having such an enjoyable time we thought, what could be a better way to finish the evening than a cocktail at the Artesian Bar at the Langham hotel – and it certainly didn’t disappoint!